EJIDO LUIS ENCINAS JOHNSON, Sonora, Mexico - There are plenty of rumors about the last stretch of the Colorado River. Most say it's a trickle, a dead zone, a river no more. A paradise lost for good. Juan Butron knows it's not quite that simple. Butron and I are standing next to a line of rusting trucks at the edge of a crumbling riverbank, looking 15 feet down at the wide, shallow flow of the Colorado River at low tide. On the pale-blue horizon, we can see the mouth of the river draining into the Gulf of California. Upstream, a few members of the Cucapa tribe fish in the salty waters. This delta was once covered with millions of acres of lush wetlands formed by the ever-shifting, powerful flow of the Colorado River. But upstream dams and diversions have taken their toll during the last century. Behind us now is nothing but desert - not the towering-cactus kind of desert, but a salt-soaked desert with hardly a plant in sight. The mouth of the river used to sustain fields of cotton and wheat in nearby Ejido Johnson, the tiny town where Butron and his family have lived for almost 30 years. In the ejido, Spanish for a communal farming settlement, only a fraction of the land is still good for agriculture. Each morning before dawn, busloads of people leave the town's dusty main street for jobs at foreign-owned farms or factories near the border. It doesn't sound like life is getting better in the Colorado River Delta. But there's a slim chance it will. During the past 20 years, Butron and his neighbors have watched flood flows and wastewater rejuvenate a few places in the delta, creating river and wetland habitat nearly unmatched on the stretch of the Colorado in the United States. These signs of life have inspired hope in the small towns here, and they've energized other Mexicans who care about the delta. 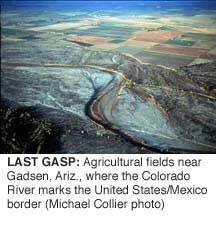 And for the first time, environmental groups in the United States are leaping over the international border that hides the mouth of the Colorado River from the rest of the basin. They're trying to change the oldest unwritten law of the river: Take all you can get, and never let it go. "A deep and emerald hue"
Few accounts of the glory days of the delta survive, but we do have one star witness. In 1922, conservationist Aldo Leopold spent several weeks paddling a canoe through the delta's wetlands in Mexico. "The still waters were of a deep and emerald hue, colored by algae, I suppose, but no less green for all that," he wrote. "A verdant wall of mesquite and willow separated the channel from the thorny desert beyond. At each bend we saw egrets standing in the pools ahead, each white statue matched by its white reflection. Fleets of cormorants drove their black prows in quest of skittering mullets; avocets, willets and yellow-legs dozed one-legged on the bars; mallards, widgeons and teal sprang skyward in alarm." In its prime, the Colorado River dumped about 70 percent of its substantial sediment load near its mouth, at the end of its journey to the sea. Think of the uncountable tons of soil and rock that once filled Glen Canyon, Boulder Canyon, and the Grand Canyon; most of that rode the river current southward for hundreds of miles. Over time, the Colorado deposited a deep wedge of fertile soil stretching from north of what is now Palm Springs, Calif., to the Gulf of California. The soil was the foundation for the verdant forests Leopold described, and it now supports the produce empire in the Mexicali and Imperial valleys. Healthy river deltas are restless places. The river was once its own manager, building and demolishing earthen dams of soil, flooding and then abandoning depressions such as the Salton Sink (HCN, 6/19/00: Accidental refuge: Should we save the Salton Sea?). Wetlands and gallery forests formed and reformed along the river, harboring rich populations of birds, fish, and even bobcats and jaguars, who came down from the nearby Cucapa Mountains to hunt in the delta. A working delta is also a battleground between river and sea. In November of the same year that Leopold was peacefully paddling through the delta, the little steamboat Toplobampo chugged upriver from the Gulf of California. There wasn't anything unusual about that; in the 19th century, the delta was navigable, and steamboats traveled frequently between Yuma, Ariz., and the Gulf of California. But this particular steamboat never made it to port. A 15-foot-high wall of water knocked it flat in the middle of the night, killing 86 of its 125 passengers and marooning the rest for days on the scorching, mosquito-ridden mud flats. "There was hardly time for a single cry," wrote Frank Waters in his 1946 book The Colorado. "The wave caught the Toplobampo squarely abeam, snapped the hawsers like threads, and rolled the ship over like a log." That wall of water was the Colorado's tidal bore, the dramatic result of the clash between fresh- and saltwater. The Gulf of California is famous for the enormous tides that barrel up through the narrow channel between the Baja Peninsula and mainland Mexico. When those tides funneled into the roaring mouth of the unfettered Colorado, no one wanted to be in the way. The sometimes violent mix of waters in the delta formed one of the largest and most productive estuaries in the world. Fish such as corvina, mullet and tilapia were plentiful in the southern delta, and shrimp abounded in the upper gulf. The Cucapa tribe, the "river people" whose members once lived off the delta's harvest of game and native plants, found their best hunting grounds at the mouth of the river. But the river people and the delta's wildlife were the last to be considered when the waters of the Colorado were divvied up. The 1922 compact on the river split up all the water among the seven U.S. basin states, and no water was set aside for Mexico until the two countries signed a treaty in 1944. The treaty promised Mexico 1.5 million acre-feet of water every year - about 10 percent of the river's flow - but all of that was quickly diverted for agriculture in the Mexicali Valley in northern Mexico. During the dam-building era, floods became the lifeblood of the delta. For six years after Hoover Dam was completed in 1936, no water from the Colorado reached the sea. Then, after the reservoir filled, a trickle of floodwater made it past the system of dams and diversions and returned to the delta. In 1964, when Glen Canyon Dam was completed, the cycle began again. Dams didn't erase the tidal bores, but they did make them a lot more ... boring. A few hours before or after our trip to the mouth of the river, Juan Butron and I would have seen the modern version of the tidal bore, a muddy rush of water filling the river's channel. High tide now overwhelms the paltry flow of the river, and the conditions in and near the river mouth are grimly referred to as a "negative estuary," a flow nearly as salty as the ocean. The salt has poisoned much of the wildlife that used to thrive here, and overfishing has almost finished off several species. The Cucapa dwindled with their livelihood, and only about 200 still live in Mexico, largely isolated from the more than 800 tribal members who live on a reservation in Arizona. The dams also trapped the rich silt that once reached the delta, leaving only a colorless stream to cross the border. Now, the soil in the delta is eroding, not accumulating. The deep ditch that Juan Butron and I balanced beside is almost all that's left of the delta. Almost, but not quite. Though the delta is still a damaged landscape, it's finally getting a few lucky breaks. Three years ago, a University of Arizona professor named Edward Glenn and his colleague, Carlos Valdes-Casillas, flew over the northern end of the Colorado River Delta in Mexico. Glenn had never had a bird's-eye view of the river above its confluence with the Rio Hardy, but he'd been exploring the delta region for more than two decades. He expected little more than a panoramic perspective on tamarisk groves and salt flats. Instead, they saw a winding green thread of native cottonwood and willow trees along the river channel. "I said, 'Carlos, those aren't supposed to be there, those were supposed to disappear,' " says Glenn. "That sight revealed the whole story to us." The story is this. For nearly 20 years after the completion of Glen Canyon Dam, almost no water from the river reached the ocean, and the tail end of the Colorado mostly lived up to its gloomy reputation. In 1968, flow readings at the southernmost measuring station on the Colorado were discontinued, since there was nothing to measure. But by the early 1980s, all reservoirs on the river were full, and the U.S. Bureau of Reclamation allowed the extra water to occasionally flow across the border. It was too much for the Mexicali farm fields to soak up all at once, and in the flood year of 1983, the river reached the Gulf of California for the first time since Glen Canyon Dam went up. The wet winters of the 1990s continued the sporadic floods. Glenn says fish populations in the Mexican stretch of the river have "exploded," increasing as much as tenfold since the beginning of the floods. Even though most of that water arrives too early in the year to help the riverside habitat, some of the native vegetation on the northern end of the delta has already sprouted back. When migratory songbirds cross the border, they're now welcomed by a 60-mile-long corridor of forest, stretching from Morelos Dam to the river's confluence with the Rio Hardy. Because the river on the Mexican side is relatively free of riprap and concrete channels, the flood-fed recovery in Mexico is especially dramatic. Researchers estimate there are 34,500 acres of forest containing cottonwoods and willows along the river in Mexico - about three times more than along the lower Colorado in the United States. "Like a lot of other people, I had a notion that there's sort of this lifeless sewer down there," says Jan Hart, an ornithologist with the U.S. Geological Survey who visited the river in Mexico for the first time last year. "I'd been hearing there were these stands of cottonwoods there, and it was hard for me to imagine, but there they were. When you work in the desert and you see those stands from a distance, it's like seeing veins of gold. You say, 'Wow, this is good habitat.' "
Yet that good habitat is sustained by chance alone. "Those flood flows are accidental, and they're in no way assured or allocated for the delta," says David Hogan of the Center for Biological Diversity's Southern California office. "Reclamation giveth, and Reclamation taketh away." Edward Glenn knows all about the accidental generosity of the Bureau of Reclamation, since it's figured large in the delta's recent revival. A little more than a decade ago, he helped to uncover one of the agency's big secrets: its engineering has unintentionally created some of the best wildlife habitat in the delta. In 1977, the Bureau completed work on the MODE canal, which every year carries 35 billion gallons of irrigation runoff southward from Yuma, Ariz. The runoff dumps out on the eastern edge of the delta in Mexico - just a mile or so from Ejido Johnson. Two years later, Glenn visited the end of the brand-new canal. "I wanted to see where all that water was going, and I found it had formed a great big lake," he says. "I kind of filed that away in my memory, and about 10 years later ... I went down to the end of the canal again, and the lake had become a wetland. I knew it was really something, since that kind of habitat is really rare there." Glenn thought he was the only person in the scientific world who knew about the 50,000-acre marsh, which is in the delta but isolated from the Colorado River. Yet when he told staffers at the Bureau of Reclamation what he'd seen, they pulled out detailed maps from recent aerial surveys. "They knew everything about it," says Glenn. "They just weren't telling anyone." The Bureau of Reclamation had its reasons for keeping quiet. The MODE, which stands for Main Outlet Drain Extension, was built to drain irrigation water from agricultural fields in southern Arizona while the agency constructed a $250 million desalting plant in Yuma (HCN, 2/21/94: Draining the budget to desalt the Colorado). When the plant was completed, the agency planned to treat the irrigation water and put it in the Colorado River. The water would satisfy an amendment to the 1944 treaty, one that guarantees Mexico relatively pure water from the Colorado. Then, the agency intended to use the canal to drain leftover brine into the marsh. The concentrated salt solution would kill the marsh and leave its wildlife with nowhere to go; Reclamation giveth, and Reclamation taketh away. But the hugely expensive water treatment project took almost 20 years to finish. During that time, the United States used floodwater to fulfill its obligation to Mexico, and irrigation runoff from the canal kept expanding the marsh, now called the Cienaga de Santa Clara. In 1992, the plant began operating at one-third capacity, but it was shut down less than a year later when a flood damaged the MODE. In the early 1990s, several Mexican scientists recognized the ecological value of the cienaga. They pushed to include the new marsh in a biosphere reserve planned for the upper Gulf of California and the river delta, a designation sanctioned by the United Nations. In 1993, when the marsh was added to the reserve at the last minute, it instantly gained a new status that's hard to argue with. "If anything happens with that water, if (the Bureau of Reclamation) decides to use it for the desalting plant in Yuma, everybody is going to blame them, because the Cienaga de Santa Clara is a famous place now," says Jose Campoy, the young, enthusiastic director of the 2.3 million-acre Biosphere Reserve of the Upper Gulf of California and Colorado River Delta. "I'm going to complain," he promises, "and the whole of Mexico's going to complain. "But the sad part is, the water going to the cienaga is not ours, it's yours," he adds. "So if you decide you want to take it, it's your choice." Yuma's colossal desalting plant now stands silently next to the Colorado River, and tourists are allowed to peek in the windows and visit an information center. But even though the river's full reservoirs are expected to satisfy the treaty with Mexico for 20 to 25 years, the plant might not stay in mothballs. Plant manager Paul McAleese says a power plant in Mexico is interested in buying desalted water from Yuma, and the plant's full-time staff is looking for other customers. A page on the plant's Web site reads like a classified ad ("If you are interested in purchasing high-quality reverse-osmosis water, call ..."). So the coast isn't clear for the new marsh. But the publicity drummed up by Ed Glenn and others has pushed the agency to study the potential effects of the plant on the ci?naga, and to find other places to dump its brine. "We're looking for alternative approaches," says Bob Johnson, the regional director of the Bureau of Reclamation. The plant would cost about $24 million a year to operate, and Johnson says the irrigation water flowing through the MODE canal has "created a significant environmental resource in the cienaga." To Juan Butron, the cienaga isn't just a "significant resource"; it's a second chance for his community. It's an overcast early morning on the Cienaga de Santa Clara, and Butron and his son Jose Juan quietly paddle an aluminum canoe through a maze of cattails near the MODE canal. It's not long before we hear the loud, clattering call of a Yuma clapper rail from the thickets that loom over our heads. This accidental wetland is a windfall for the delta's struggling wildlife. The shy Yuma clapper rails are endangered in the United States and Mexico, but more than 6,000 are packed into this marsh. The population is so dense and healthy that some birds might be traveling northward to repopulate former habitats on the other side of the border. The Cienaga de Santa Clara is also a haven for migratory birds and the largest known population of the desert pupfish, listed as endangered by both the United States and Mexico. When the dams cut off the river's flow in the 1960s, the wetlands in this area all but dried up. During the following years, "we could just walk through here," says Juan Butron in Spanish, gesturing at a huge expanse of open water. "We didn't need boats then." About a decade later, water began pouring out of the MODE canal, and part of the past returned. There are more than 200,000 people who live in the small towns like Ejido Johnson scattered throughout the delta. Until the river started to sputter and choke, many made a good living from agriculture or fishing. Even so, Elena Chavarria of the Mexican environmental group Pronatura Sonora says some don't believe restoration efforts could help their communities. "When we started talking to them about restoration of the river, when we said the river had been green and clean less than 50 years ago, most younger people had no idea what we were talking about," she says. "For most of their lives, there's been no water in the river." For almost 10 years, Chavarria has organized outreach programs in agricultural towns, small tourist camps near the border city of Mexicali, and Cucapa tribal communities along the river. "We try to find out what's important to them about the river," she says. "We don't say, 'You have to care about this because of migratory waterfowl.' Sometimes there's good news, and sometimes it's heartbreaking, because progress is very slow." The water flowing over the border has done what her work sometimes can't: It's started to remind the communities what they can gain from the river. The Ecological Association of Users of the Hardy and Colorado Rivers, made up of hunters, farmers and fishers from several delta communities, has begun to participate in city and state planning efforts in the northern delta. It now wants to open an office in the city of Mexicali for easier access to the officials who control water in the region. 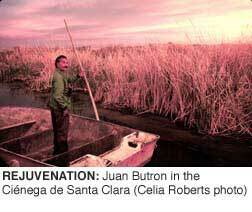 The Cienaga de Santa Clara has also brought a spark of hope to Ejido Johnson. 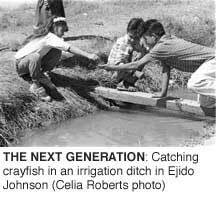 Ejidos were established by the federal government in the 1930s, and most were partially privatized in the 1990s. Since the river started to shrink, there have been few ways to make a living here, and many people have moved away. Juan Butron wants to give those remaining a reason to stay. He and a few other people in town have started a fledgling tourism business in the marsh, offering canoe trips for birdwatchers and sportfishers. They've turned a once-abandoned house into a small program office, and they've built a couple of palapas for camping on the edge of the marsh. The townspeople are getting some help from the biosphere reserve and from La Ruta de Sonora, a nonprofit educational tour group based in Ajo, Ariz. Executive director Isabel Granillo, a Mexican citizen, says some in the delta region are surprised that others come from far away to see what's here. "Then they think, 'OK, I'm protecting these things so I can show them to these other people,' " she says. Tourism isn't a cure-all. But the ever-growing marsh and its trickle of visitors have kept Butron inspired for more than 20 years. "When that water arrived, I thought it was going to be good for the birds, good for the fish, and good for the ejido," he says. "I thought we had a future." It's not just water that's crossing the border. For years, environmental groups in the United States have concentrated on the upper reaches of the Colorado, dismissing the lower river and the delta as a hopeless catastrophe. But as word of the cottonwood forests and the new marsh spread, some groups took a hard look at their maps and erased the international boundary. "Before, the delta was just covered with saltcedar, and there was no river at all, just sand," says biosphere reserve director Jose Campoy. "Now, with two El Nino events in the '90s, all that vegetation really grew up. That's when a lot of people opened their eyes and said, 'What! Maybe with just a little water, or some floods every two or three years, we can have the river - alive.' "
The U.S. groups joined with the scientists and Mexican environmentalists who have been working on river and delta restoration since the early 1990s. The speedy revival of the river corridor has given the members of this loose coalition hope, too. They think these remnant habitats could someday be linked with one another, a partial reconstruction of the "hundred green lagoons" that Aldo Leopold saw. But the first goal is to hang on to the water flowing into the delta, since there's no guarantee from either country that the water will stay in the river. "We're not talking about bringing the dams down," says Mark Briggs of the Sonoran Institute in Tucson, Ariz. "We're talking about getting some flows, not huge ones, just enough to keep native wetlands alive. That's the start." Even that is a challenge. The United States uses about nine-tenths of the river's water, and to most of the people who use that share, the delta is an abstraction. So these groups started with publicity, releasing easy-to-read reports on the scientific research in the delta. "We tried to make it interesting to the world," says Chelsea Congdon, a former staffer for the national group Environmental Defense. "We wanted to capture people's imaginations." Environmentalists are now starting to wedge the delta into the debate over Colorado River water policy, most of which takes place in offices and conference rooms a world away from Ejido Johnson. In November 1999, the Center for Biological Diversity, Defenders of Wildlife and 37 other U.S. and Mexican environmental groups sent a letter calling for a formal agreement between the United States and Mexico, a promise of water for both the main stem of the river and the newly established Cienaga de Santa Clara. The next month, 15 of those groups sent a notice of intent to sue to nine U.S. agencies, citing agency violations of the Endangered Species Act for endangered fish and birds in the delta and the upper Gulf of California. They were to follow through with a lawsuit at the end of June. Official response to these efforts has been cool. Bob Johnson of the Bureau of Reclamation, for instance, says his agency isn't responsible for protecting animals that are listed as endangered in the United States but located in Mexico. "We're willing to consider the broad needs of the delta in consultation with the country of Mexico," he says, "but Mexico is another country. The laws of the United States don't apply there." Environmental groups are also trying to push the delta through another crack in the policy barriers. The U.S. government wants to establish a set of temporary rules for managing the river's flood flows by the end of the year, rules that Interior Secretary Bruce Babbitt says must cause "no net loss" of environmental benefits. Armed with Babbitt's statement, several environmental groups are agitating to get some of those flows guaranteed to the river itself. They eventually want a commitment from both governments to keep water in the river all the way to the Gulf of California. But the U.S. government is not considering the environmentalists' proposal while it develops the temporary rules for flood flows. Instead, it plans to continue to send nearly half the floodwater to urban California for the time being. Here's why: Because most of the other basin states don't use their full portions of the Colorado, California has long been able to take more than its share. It now uses up to 5.2 million acre-feet per year, far exceeding the 4.4 million acre-feet allocated to the state by the "Law of the River," the series of agreements and treaties among the basin states and Mexico. But now, the other states are increasing their use of the Colorado (see story, page 6), and they want California to stop hogging the river. So the Department of Interior and the seven Colorado Basin states are set to adopt a new water-use plan for California by the end of the year. The plan, a priority for Babbitt, would cut California's use of the Colorado down to size by 2015. Both California and Interior say the flood flows are needed in the short-term to ease the thirsty state's gradual transition to the new plan. The other basin states have agreed, but reluctantly, since they'd like California to toe the line as soon as possible. Any serious discussion of flood flows for the delta might throw a wrench into the fragile truce among the states and Interior. Federal officials also argue that any international agreements on flows have to be negotiated by the International Boundary and Water Commission, overseen by the U.S. State Department and its counterpart in Mexico. The commission is cooperating with Mexico on a study of the delta, and a joint declaration between the United States and Mexico in mid-May emphasized the importance of the project. Yet the promise of another study isn't good enough for most environmental groups. "They've been saying the same thing for 70 or 80 years - that we'll get to the environment eventually," says Michael Cohen of the Pacific Institute, an environmental policy research center in Oakland, Calif. "Well, when is eventually?" Big changes in policy may be some time in coming, but the delta is getting a little help from the powers-that-be in both countries. A letter from Deputy Interior Secretary David Hayes to several U.S. environmentalists in mid-May acknowledged for the first time that 80 percent of the best habitat on the lower Colorado is in Mexico. "Restoring the ecological integrity of the Delta is in the interest of both the U.S. and Mexico," he wrote. There has also been some motion within the Mexican government. Less than half of the protected areas in Mexico have regular funding, but the biosphere reserve is one of the luckier ones. In 1996, three years after its establishment, the huge reserve got enough money to start paying staff. Its annual budget is still at the shoestring level - about $150,000 - but director Jose Campoy says the reserve can now pay for salaries, some equipment and fuel. Outgoing Mexican president Ernesto Zedillo is far from an environmental champion, but at the beginning of his administration in 1994, he created the Secretariat of the Environment, Natural Resources, and Fisheries, equivalent to the U.S. Department of the Interior. The agency is headed by prominent Mexican environmentalist Julia Carabias, and it includes Mexico's first central office for protected areas. And in early March, Zedillo bowed to pressure from an international coalition of environmental groups and canceled plans for a gigantic salt factory on the Baja Peninsula. The victory boosted the confidence of a similar coalition - the U.S. and Mexican groups working to protect the delta. Carlos Valdes-Casillas of the Monterrey Technical Institute in Guaymas, Mexico, says there's limited but growing concern about the delta among Mexican officials, and some support for an environmental amendment to the 1944 treaty between the United States and Mexico. "The treaty used to be almost a taboo subject," he says. "It was assumed that it was never going to change." Official U.S. interest in the delta still pales in comparison to the support for domestic projects such as the Salton Sea restoration. To many on this side of the border, the Colorado River Delta is still a land of rumor and myth. And to many in Mexico, the delta is still a bitter symbol of the forces that hold sway upstream. But Edward Glenn says there are signs of life, both in the delta and in the seats of power on both sides of the international boundary. When he first started driving from Tucson to visit the Colorado River Delta more than 20 years ago, allies were hard to come by. "There was no acknowledgement on the official level that these things were environmental assets," he says. "Now, there's a whole cadre of people working on it. They don't need people like me to run down there and make discoveries anymore." Michelle Nijhuis is an associate editor at HCN. Thanks to Merrylea Bennett-Carey and Dev Carey for help with translation. Jennifer Pitt, Environmental Defense, 303/440-4901. Juan Butron doesn't have a phone, but he'd be happy to speak (in Spanish) to anyone who finds their way to Ejido Johnson.